Grand Prize The grand-prize winner in the 2014 MSD Artwork Contest at VIMS goes to first-grader Johnny Vaughan of Williamsburg. Painting by Johnny Vaughan. 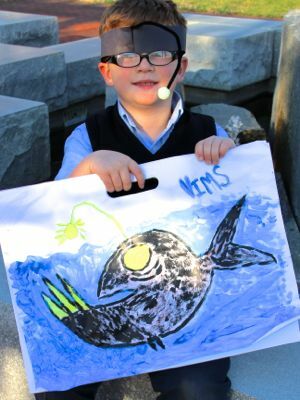 Grand prize in the Virginia Institute of Marine Science’s annual Marine Science Day artwork contest goes to Johnny Vaughan, a 1st-grader at Walsingham Academy in Williamsburg. The contest offers community members—both children and adults—a chance to design the artwork for VIMS’ popular open house, which this year takes place on Saturday, May 17th. Entries for the 2014 contest focused on bioluminescence, the theme for this year’s Marine Science Day celebration. The production and emission of light by a living organism, bioluminescence is a common adaptation to life in the perpetual darkness of the deep sea. VIMS Professor Eric Hilton, an internationally known expert on fish anatomy and evolution, says that Vaughan’s watercolor “really captures the essence of a bioluminescent anglerfish.” Hilton notes that the Nunnally Ichthyology Collection at VIMS has a large collection of anglerfish and other deep-sea fishes, many of which will be on display during Marine Science Day. 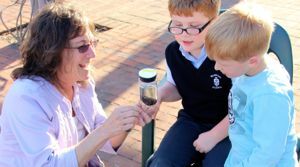 Professor Deborah Steinberg—who studies how the rain of organic material from sunlit surface waters affects deep-sea food webs—met with the 7-year-old Vaughan and his parents outside the Williamsburg Regional Library to officially notify them of the award. She says “I love Johnny’s use of color, and was impressed that he used fluorescent paint for the fish’s lure. 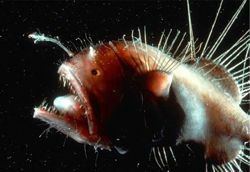 In female anglerfish, the lure glows due to the presence of bioluminescent bacteria. Steinberg and Vaughan—plus his parents and 5-year-old brother Morgan—engaged in a wide-ranging discussion that clearly showed Johnny’s precocious knowledge of marine biology and other scientific fields. “My favorite deep-sea creature is the colossal squid,” said Vaughan. He also “likes gulper eels” and is fascinated by the discovery in 1990 of a super salty “underwater lake” at the bottom of the Gulf of Mexico. He and his brother are also intrigued by the concept of infinity. Vaughan is knowledgeable about the many ways that deep-sea creatures use bioluminescence—to lure prey, startle predators, and attract mates—but was surprised by the small size of the anglerfish specimen that Steinberg showed him from her research collection. Steinberg says this is a common response. “Most people expect anglerfish to be much larger than they actually are because they can look so ferocious with their spikey teeth,” she says. “But because there’s so little food in the deep sea, most of the organisms that live there are quite small.” The adult female anglerfish in Steinberg’s collection is about the size of a teacup. Vaughan and his father say the next step in his budding scientific career is to identify and replicate the 100 most important scientific experiments of all time. “We’re thinking of starting by building a telescope to test Galileo’s observation that Jupiter is orbited by four moons,” says the elder Vaughan. “People didn’t believe Galileo when he first said that,” adds Johnny. Galileo’s observations of Jupiter and Venus helped prove the Copernican model of a sun-centered solar system. Vaughan’s Grand Prize artwork will be used in advertisements and featured on the official 2014 VIMS Marine Science Day T-shirt, with limited numbers of these on sale in the VIMS Gift Shop during the event. VIMS is still accepting votes for its “People’s Choice Awards,” a separate category of the Marine Science Day art contest. The kid’s and adult artwork that receives the most "likes" on the VIMS Facebook page between now and May 3rd will be recognized along with Vaughan and other contest winners during the Marine Science Day awards ceremony on May 17th.